Happy At Home: Can You Feel It? A tingle of anticipation . . .
A giggle of excitement. . .
and By Golly have a Holly Jolly Christmas Season! 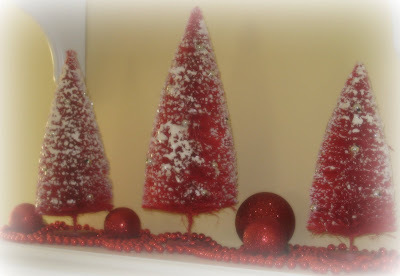 I saw some trees like that at Michael's....love them and your display. It looks especially pretty all in red! We are starting to feel festive here too...except it is 60 degress again today and sunny! oh, I feel it! and I love the red trees, but even more so, the glitter houses!!! I have a collection that I will bring out as soon as the dust settles here - and I mean the real dust from renovations!